It is amazing how the holidays kind of sneak up on us every year. It is that time again, the calendar is starting to fill up with holiday activities and family gatherings. This is a beautiful and exciting time of year, but it can also be stressful. There is so much pressure that we put on ourselves to bake ALL the Christmas cookies, send out Christmas cards, purchase gifts for ALL the people in our lives, participate in ALL the festive happenings around the city and of course see every family member that you don’t see the rest of the year. All of this stress that we put on ourselves can leave this joyful time of year, feeling somewhat depressing and just plain overwhelming. That is why I think there are some easy tips for you to remember through the next month to help you feel less stressed and consumed in all of the hustle/bustle of the holidays. Prioritize your time. This is huge. All of us want to be able to do ALL this things this time of year, but that isn’t always realistic. Make a list of things that you want to do and then go through that list again and prioritize what the most important things are to do for this year. Maybe going to see Santa, doesn’t make the cut this year or maybe it is focusing on doing an activity with a close family member who will actually be in town on a specific day. If you aren’t able to do all the things that you would love to do this holiday, that is ok. Make sure you prioritize and make time for the really important things/memories. Make activities family affairs. If you do have a list of things you want to do this holiday season (decorate the house, make cookies, wrap gifts, volunteer somewhere, etc) make those activities family affairs. Include your children, your spouse, your extended family and do those activities together. I know sometimes cooking with children takes more time and is messier, but that way you are getting some quality time together while doing things that you would be trying to do on your own. So much of what we like to do over the holidays is centered around others, why not spend some of that time actually doing those activities with those people we care about. Make time for you. I know this is a crazy concept, but take some time each day for you. It can be something simple, like sitting in peace and quiet for 15-20 minutes on the sofa with no expectations for yourself. Give yourself some grace and love. It can be take an extra warm shower or getting a new mask to use and try it out afterwards. This time is important to help handle stress and give you a chance to reset. Enjoy the holiday season and find ways to help you feel less stressed. It is a wonderful time of year, but stress can often make seen overwhelming and less fun. Hopefully some of these tips and tricks will help you enjoy the holiday festivities more! Easter came early this year! I hope you all had a wonderful Easter yesterday. Often this holiday is filled with candy and sweet treats, just like Valentine's Day. It is so easy to pick up a bag of candy for those Easter eggs and find yourself eating all of those bite size goodies. Two weeks before Easter, I picked up a bag of bite size candies and totally found myself snacking on them at night. Terrible, I know! It was just so easy to pop one in my mouth. Honestly, I didn't need to buy a bag of candy 2 weeks before Easter, because really, did it make it to Easter? Nope! Sure didn't! I am sure that you all had some delicious goodies leading up to Easter and now that the day has come and gone, you probably have some of those candies sitting on your counter or in your cabinet. How do you find balance with those goodies and making healthy choices? I am a dietitian who does believe that all foods can fit in a healthy diet. Now I don't recommend you purchase candy, when you don't need it, like I did two weeks ago. I would tell you to enjoy a piece or two of candy for the holiday, but don't bring it into your house if it is going to be a stumbling block for you. 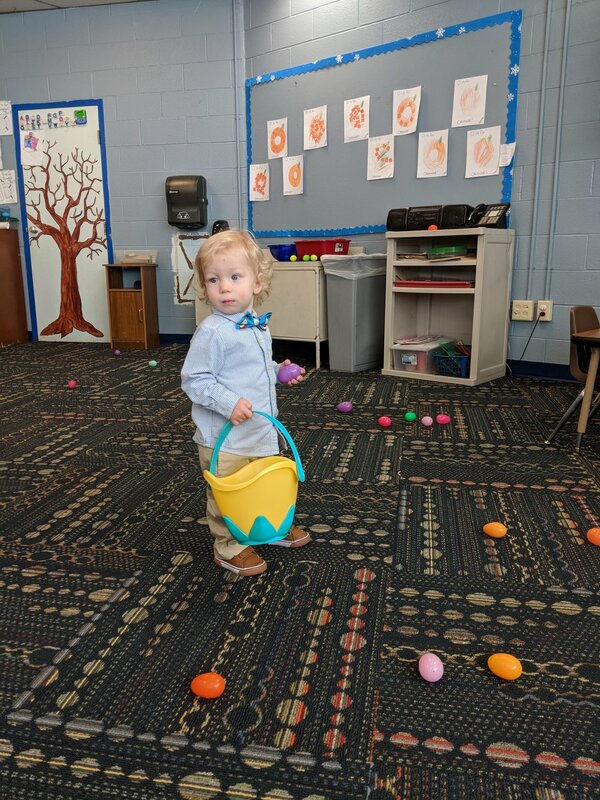 If you have little ones in your house, then you might think you have to purchase candy to fill up those Easter eggs with, but I am here to tell you that you don't have to put candy in those eggs. We put Goldfish crackers, grapes and some other little food items in our eggs for William. Instead of having him find candy (which he doesn't need) we decided to try some healthier alternatives. You might think goldfish aren't exciting or fruit is lame, but this kid loves both so I think he will be excited. The two take aways from this post are 1) Those extra treats from Easter, come up with a game plan. Definitely enjoy them, in moderation and then if you have to, throw the rest away. Don't feel guilty about that. If it is going to be a stumbling block for you. Get get of rid it and get rid of that temptation. 2) Your kids goodies don't have to be candy. There are lots of things that you can give your child for Easter that isn't just candy. Don't feel like you are depriving your child anything. I think teaching kids to celebrate with items that aren't food is an important lesson as they grow up. 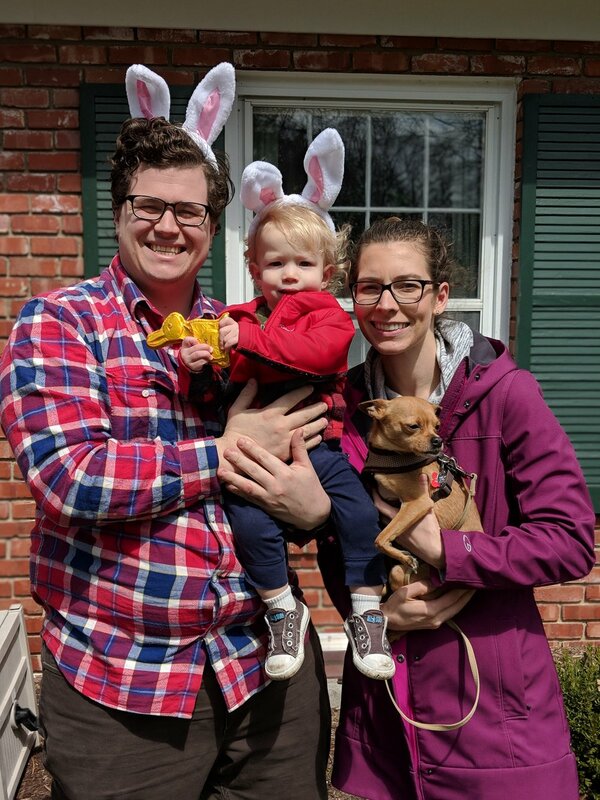 Hopefully you all had a wonderful Easter and enjoyed the day! I have included some pictures below from our time with family over the weekend! I am a sucker for a good Christmas cookie. I love baking around the Holiday Season and having an excuse to eat a delicious little Christmas cookie is just what I want to do while sipping hot tea on the sofa. Have you thought about what you are putting in those yummy little treats that you make each year. There is normally quite a bit of sugar and fat that is goes into making a yummy, Christmas cookie. 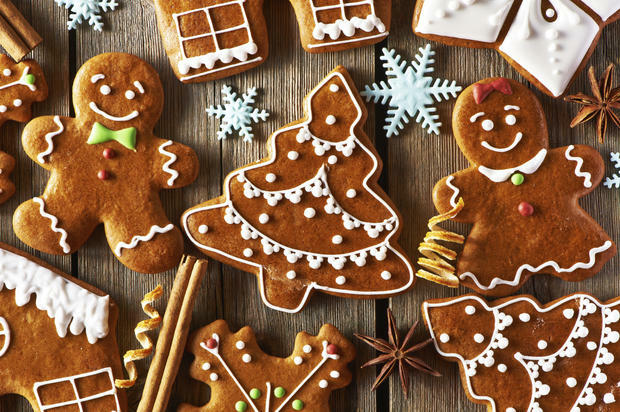 There are some ways that you could make some healthy substitutes and work on making your holiday treats a little bit healthier. I found some of these recommendations from Eating Well Magazine. Lots of times people don't think about adding a little bit of additional fiber to increase the "bulk" of the cookie. This an easy way to work up on your fiber intake and this can benefit your heart health. You can replace some or all of your flour with whole wheat flour. This is a simple substitute that would make your breads or cookies even healthier. If you make that switch you add get 4 times the amount of fiber compared with the all-purpose flour. If you don't like whole-wheat flour or are gluten free, you could try rolled oat flour as well. This would increase your fiber intake and also could be gluten free. They other thing you could add could be flaxseed or chia seeds. Obviously, both of these options could change the texture of the cookies or bread, but if you add a little you could give a little boost to your fiber intake per cookie. Any type cookie or quick breast, typically calls for lots of added sugar. Cut down on the total amount of sugar you add into the recipe and try to replace with some extra flavor enhancers (almond, vanilla, orange or lemon extract). Play with the recipe to try cut down the sugar a little bit at a time. You could also use "natural" sweeteners like agave, honey or molasses. That is still treated as sugar, but is a natural source that you could use. Flaxseeds are a great source of omega-3 fatty acids and fiber. This is a great additional to a cookie that has texture, like oatmeal or a highly flavored cookies (gingersnaps or something with molasses). That will help to hide the texture and the flavor from the flaxseeds. You could also use flaxmeal for a smoother texture. These omega-3 fatty acids are great for heart health and can help with cholesterol levels. You could also work to decrease your use of processed trans fats by using canola or olive oil. These also have more heart healthy fats. There are lots of way to tweak and change your favorite holiday recipes around to make them a little healthier. Obviously, if you want to keep your recipe the same and enjoy it this one time a year, that is fine too. I don't want to be a Scrooge about it, but I also want you to know that there are ways to make small changes that can have big impacts on your overall health. This was a very timely topic for me this week. I wasn't able to sleep the other night, because I was thinking through everything that I needed to do. Working full time outside the home and then coming home, there is SO much to do. Having the time to get things done is tough. With limited time that means that often stress levels can go up and even more so around the holiday season, because we like to try to "special" things like bake cookies, put up special decorations or spend more time with family. All of these "special" things are great, but can increase your stress level. 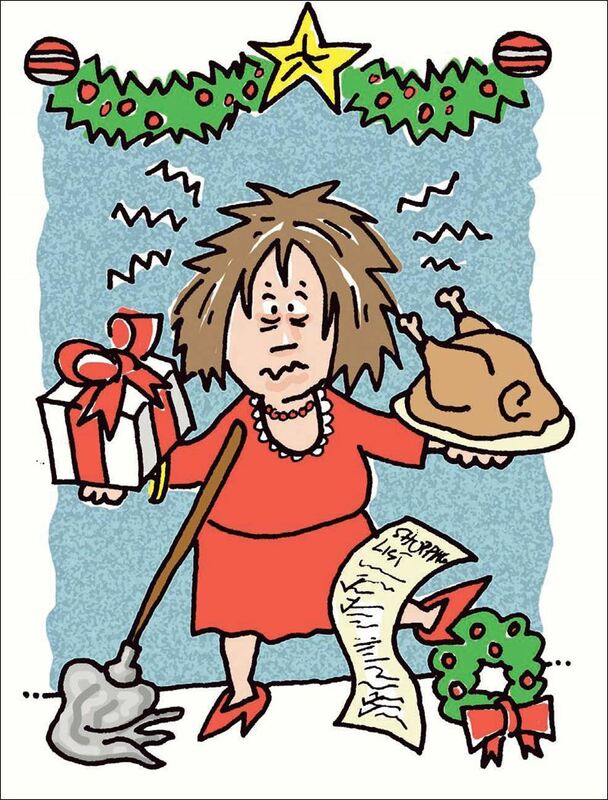 So what can you do to help manage your stress around the holiday season? Here are some helpful tips and tricks that you will hopefully find helpful. This is such an important and simple things to help clear your mind and decrease worrying about all that you have to do. Simply taking the time to put your thoughts onto a piece of paper helps you take those concerns and set them aside. You don't have to worry about forget anything, because you wrote that "To Do" List down and you can come back to it when you have time. When you are able to come back to that list and start accomplishing things, check off what you have gotten done so you can experience that sense of accomplishment. This is easiest to do, after you put together your "To Do" List, take a look at what you need to accomplish and then rank them in order of what NEEDS to happen first. There are always something on that list that takes priority compared to other items. For example, I had to get leaves raked in my yard and the lawn mowed one last night by the weekend. That was a task I wasn't wanting to do, but NEEDED to do before the weekend. So I needed to take time and do that activity before I go out Christmas decorations. I would have much preferred decorating for Christmas, but in terms of priority levels, decorating fell below the leaf raking. In the craziness of life, things gets messy. Sometimes your house is a disaster and some times that needs to be ok. If you have made out your "To Do" List and you have other things that NEED to happen first, then do those things and bump cleaning down on the list. Or if you have the ability to get help with cleaning through someone coming into your house or even have your spouse help you. Sometimes delegating this task is helpful. For example, I have embraced the fact that when William is up and wake the house will have toys everywhere. Then at the end of night, we walk around pick up toys and that is when things get cleaned up. So embrace the craziness and then try not to stress too much about it. This is a life motto that will always make you happy. Put people in your life first. Relationships with people you work with, people in your family, and your friends are important and that will bring you more happiness then anything else. When you make time for people, that is always the right choice. Taking the time to go out of your way to see that friend (you only see a hand full of times a year), that friend who lost their mother, your aging grandparent or a friend who might be lonely .... that always is the most important thing. With the craziness of the holidays, remember that you are not perfect and things won't go perfectly and that is OK! The main things are taking time for those people you love and everything else will get done and it will be a fantastic end to the year! Now excuse me while I go tackle my "To Do" List - first up, Christmas decorations. All of us, enjoy all the food that is associated with the Holiday Season - everything from the cookies to the turkey. It is so much fun to gather with family and friends, celebrate another year and eat delicious food. For all of the time that goes into making a gorgeous holiday spread, you want to make sure that your meal or appetizers do not end up making your loved ones sick. That is why food safety is so important, especially this time of year. There are some great handouts and information available from the CDC and FDA. Food borne illnesses are a serious issue in the United States causing ~76 million people to become sick each year. The most common food borne diseases associated with meat, poultry and fish are Salmonella, Campylobacter and E coli. Pregnant women, older adults, infants, young children and those with a weakened immune systems are at higher risk for severe infections. Clean - Always wash your hands with warm water and soap for 20 seconds before touching or preparing any food. This is the best way to prevent the spread of food borne illnesses. This also applies to all your kitchen equipment and utensils - clean them with warm water and soap, especially in between working with meat and produce. Separate - Keep your meat and produce items separate. Use a separate cutting board for raw meat, poultry and seafood and then use a different one for fresh produce. This helps to prevent cross-contamination. Remember to keep the juices of these fresh meat items away from any already prepared foods as well. Cook - When you are cooking your meat and poultry items make sure that you are getting the internal temperature of those food items to a safe level. This will ensure that all the microorganisms are killed. Use your food thermometer and make sure that you insert the thermometer correctly into the food item. The AND has a great page on how to properly calibrate your thermometer and use it correctly! Chill - Once your meal is over, getting your food put away and properly cooled is important. Your refrigerator should be kept at 40F or below to prevent bacteria growth. Any type of egg dish always needs to be kept in the refrigerator. Get your leftovers in the frig within 2 hours of them being out on the table and never defrost your food at room temperature. Now that Halloween is over and we are into November, the holiday season has officially started. This means lots of gatherings with friends and family and of course food! Celebrating holidays is very tightly associated with delicious meals and sweet treats. It can be challenging to always navigate this time of year in a healthy way. In addition, to the tasty food temptations, we normally are under additional stress to plan a Pinterest perfect party or give that one of a kind gift to our family members. Being able to balance the stress of the holiday season in a healthy way in terms of our minds and body is very important. Hopefully some of this information will help give you some peace of mind. Stick to a budget. We all love to spend money during the holidays from clothes, to gifts, to food and travel expenses. It can be an expensive time of year. Take some time now to plan what you can realistically afford in terms of gifts this year. Think about your travel expenses and make sure that you set aside some money for those additional costs. Having a plan will help ensure that you are successful in sticking with it. There are ways to give gifts to co-workers or family members that are more cost effective, like baking goodies to give out or putting together fun gift baskets with items from thrift shops or the dollar store. The goal is to determine your budget ahead of time and then stick with that goal. This will help decrease that stress about money and stretching yourself too thin financially. Plan ahead. This ties in to the previous point about putting together a budget. Figure out how you want to structure your time during the holiday season. What goals/traditions do you really want to do and then what things are not necessary to accomplish? If you are able to take time off, how are you planning on spending that vacation time? Have a plan in place so you know what to expect and that helps you feel less stressed. Have conversions with family ahead of the holidays to determine what days you will get together and mark that on your calendar. By looking at your schedule ahead of time, you can work hard to not over book yourself and still enjoy the holidays with lower amounts of added stress. Don’t abandon your health. This can be challenging during the holidays to not totally throw healthy habits out the window. Take time to work in some physical activity into your vacation time from work. Go on a walk with your family or play in the back yard with your grandkids. If you have a pet, take the dog for a walk or head to your local park. Even, shopping at the mall could be made into some extra physical activity by walking some extra laps in the mall or parking really far from the mall entrance. Try to break up your sitting intervals, even when you are traveling by stretching, getting up and moving around. In addition to exercise, try to set yourself up for success through what foods you are eating. Before you head to the holiday neighborhood party, grab a healthy snack: a cheese stick and an apple, so that you aren’t famished and don’t over indulge on the holiday cookies. If you are going on a road trip to see family, pack a healthier lunch with you so that you aren’t tempted to stop at the drive through to grab a bite to eat. Taking a little bit of time to plan through how you can stay active and make healthy choices, will go a long way this holiday season in helping you feel better about yourself. Take a moment for you. More often than not, the holidays have us rushing around to see family and friends and not taking time for ourselves. There are some holiday traditions or fun things that you probably love about this time of year and making sure that you pause, and enjoy that moment is important. If you love to watch Christmas movies while drinking hot chocolate, plan one night where you sit on the couch and watch the whole movie, while sipping on your hot chocolate and you enjoy that little tradition. Finding time to take a moment will help you to feel grounded and enjoy the holiday season amongst all the hustle and bustle. This time of year is so special and being able to manage your health and stress levels in a healthy way will help to ensure that you finish 2016 off right and greet 2017 on a positive note. Hopefully some of these tips will be helpful as we gear up for the holiday festivities. Remember, stick to your budget, plan ahead, don’t abandon your health and take a moment for yourself over the next month and half. By utilizing some of these recommendations, you will feel better and enjoy this wonderful time of year! It is the time of year. The holidays are under way. Halloween has just wrapped up and now November has started. That means that Thanksgiving is coming at the end of the month and then Christmas next month. I love the holidays and all the festivities that come with the holidays (the food, the family get togethers, the travel, etc). One of the big ways that Americans celebrate is with food. That means that most get-togethers include food and normally the options aren’t the healthiest. This can be overwhelming for people to know how to navigate that holiday spread and know how to make smart choices. If you have the opportunity to cook food for your Thanksgiving or Christmas holiday get together then consider making some healthy swaps to those recipes. Tweak the sweets – This incorporates making healthy options available for desserts. You can definitely include your traditional pumpkin pie, but also put together a fruit salad, which is a healthier option. This is going to have less added sugar compared with the pie and will have more fiber from the fruit, making a much friendlier diabetic choice. Cheers to good health – Make sure to watch out for added sugars and calories in festive holiday drinks. This includes regular soda, sweet tea/lemonade, and alcoholic drinks. There can be a lot of added calories hiding in these beverages. Make sure to space out your drinks with glasses of water. Set a goal to make every other glass, a glass of water versus only drinking sweet tea or that delicious mixed drink. Bake healthier – If you are in charge of cooking food for your next holiday party then consider some healthy swaps you can make when baking. You can substitute applesauce or bananas for the fat source (like the butter or oil) in various dessert recipes. You can also use greek yogurt in place of sour cream. These simple substitutions can help to decrease the overall calories in the dish you are putting together. Spice it up - Lots of us love to use salt to enhance the flavor of the food that we are preparing. This isn’t always the best thing for our heart health. Consider using over spices to add flavor that don’t contain salt, like sage, garlic, pepper, Italian seasoning or cumin. Brighten your meal – As you load up your plate, make sure to fill your plate with ½ fruits and vegetables. Your plate should be colorful and not just filled with starches like white potatoes, yellow corn and a white roll. Brighten up that plate with over colors from the rainbow such as orange carrots, green salad, red cranberries and yellow squash. Skim the fat – When your recipe calls for a full fat item like heavy cream, butter or whole milk, consider using skim milk, low fat cheese or margarine instead. This will help to decrease the overall fat being added to the dish and cut the overall calories. If you feel like the flavor would be jeopardized with this change, then add in some extra spices that are not just salt. Swap the grains – If you just have to have your dinner roll with your holiday meal, consider using a whole grain roll in place of just a white roll option. This is more diabetic friendly, because the whole grains will break down to simple sugars slower and this will help prevent a sharp blood sugar spike. This can be applied to crust of pies even. You could use half the flour in your pie crust as whole grains and then the other half white flour. This might change the texture of the pie, but might be a fun, new way to make a traditional recipe a little healthier. Go easy on the gravy – When you ask for the gravy to be passed over to you, make sure that you don’t send your turkey swimming in it. Use the gravy in moderation. If the meat or potatoes have good flavor, they might not even require gravy poured over them. This is just an extra calorie source and not always necessary if you are trying to make healthier choices. It is that time of year. "The stockings are hung by the chimney with care in hopes that Saint Nicholas soon will be there." It is hard to believe that Christmas is only 3 days away. I don't know about you all, but we have been busy around our house baking Christmas goodies, wrapping presents, shopping for food for holiday meals and trying to fit time in with family and friends. I wanted to make sure that I shared with you what I am planning on making for Christmas day. We are hosting about 9 people total over at our house for Christmas. As you can see, it is totally possible to plan ahead and make a delicious and healthy holiday meal. Make sure to make a list of the items that you will need so you don't end up at the grocery store multiple times. Then don't be afraid to delegate some of the cooking to those who are coming over. Thankfully our friends and family are all bring a couple of dishes so I am responsible for the the pork, the green beans and the cheese ball. Also try to include multiple food groups in our holiday spread - we have a lean meat option, 2 vegetables, 1 fruit, and some starch or carbohydrate in the potatoes and rolls. Enjoy this time of year with family and friends. Take the time to not stress about all the fixings, but make memories with those you care about. Merry Christmas and Happy Holidays! Enjoy time with your family and friends this Christmas and remember "everything in moderation!" Thanksgiving was last week and it is time to think about what you are doing for physical activity to help you burn off some of those extra calories. Hopefully you had a delicious and some-what healthy Thanksgiving feast. We had lots of vegetables at our gathering and they were delicious. My mother prepared some roasted squash, peppers and onions and I made a salad. It was a great first course of our dinner. Now if your Thanksgiving was filled with lots of carbohydrates and not enough movement then let's take a look at what you can do to help be active this time before Christmas. *Suggestions from Daily Burn website. Apple Pie (1 slice) = ~400 calories and to burn that off you would need to run 3.5 miles or for about 35 minutes. Pumpkin Pie (1 slice) = ~300 calories and to burn that off you would need to do yoga for 60 minutes. Buttered Roll (1) = ~200 calories and to burn that off you would need to play flag football for 20 minutes outside. Sweet Potato Casserole (1/2 cup) = ~200 calories and to burn that off you would need to take a spin class for 18 minutes. Turkey Breast (6oz) = ~200 calories and to burn that off you would need to ice skate for 50 minutes. Stuffing (1/2 cup) = ~200 calories and to burn that off you would need to run the stairs for 10 minutes. Red wine (60z) = 150 calories and to burn that off you would need to walk for 35 minutes. Keep these exercise suggestions in mind as we head into the December and the Christmas season. Staying active, despite the holiday craziness is important. As I was writing this blog post, I stumbled across this great article from Runner's World about staying active during the holidays. CLICK HERE for a link. I know that is just now the beginning of November, but in case you haven't noticed Thanksgiving is in 16 days and then Christmas is in 45 days. That means that there are lots of celebrations, family gathers and time spent around food in the next 1 1/2 months. It is time to put together a plan so that you are prepared to have a healthier and hopefully happier holiday season. I absolutely love fall and celebrating Thanksgiving, but with this time of year comes lots of delicious food and often less physical activity. I have included with tips that might help you actually make some healthy choices over the next 1 1/2 months. Don't skip breakfast! Starting off your day with a healthy breakfast will help you to eat less and make sure you are focused on making healthy choices. The key is to start that process of putting healthy foods into your mouth at the beginning of the day. Aim for 3 meals a day with snacks. Think about it as eating every 3-4 hours. Eating these small meals/snacks more frequently will help with keeping your blood sugar and energy levels steady throughout the day. Also if you have a party to attend, you can avoid arriving famished and eating everything in sight. This will equip you to have more self-control. Stay hydrated. make sure that you are consuming low calorie beverages and not just filling up on alcoholic drinks. That can be tempting with holiday parties, but those alcoholic drinks can be loaded with extra calories. Sometimes making a trade off can be helpful to limit your empty calorie intake. Promise to do 30 minutes of physical activity for every drink you consume. This can be a good way to motivate yourself to be active and still enjoy a delicious mixed drink in moderation. Portion your plate. Make sure to keep the MyPlate in mind as you fill your plate at the next holiday gathering. Try to fill 1/2 your plate with fruit and vegetables, limit your protein to about 1/4 of the plate and the other 1/4 for grains. Filling up on the vegetables, provide nutrient dense and low calories options for meals. Save a small part of your plate for your favorite dessert or treat, because it is the holiday season and everyone loves a treat. Check out the MyPlate Holiday Handout below for some other great recommendations about making healthier holiday substitutions.